These two Gran Torinos were stars of the 2004 Movie. 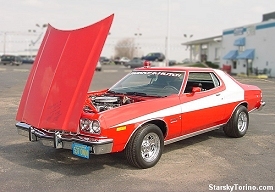 Both were restored by "Movie" Mike Walsh of Premiere Studio Rentals in San Fernando, California. Both had 351W engines built up to monster specs by Mike and his crew. 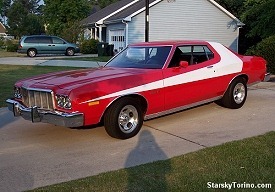 Eldon C. i nLouisiana purchased Hero Torino #1 in 2012, a 1974 Gran Torino with very low miles (on the left), and Hero Torino #2, a 1976 Limited Production S&H Unit (on the right), is owned by Barry S. in Nevada. 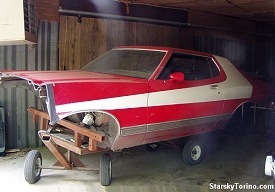 The car on the left is a stunt car now owned by Jesse L. in Georgia. It is one of several built for the movie by Ray Claridge at Cinema Vehicle Services. Penny and I saw this car on the movie set when we visited in 2003. 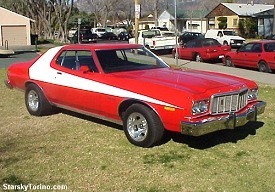 The Torino on the right was used as a tow car in the movie - meaning it was pulled behind a camera vehicle. After the movie release, it was owned by the Volo Auto Museum for some time, but is now in the capable hands of Chris I. in Chicago, and he has given it quite a makeover! The mess on the left is the "flying dunk car" from the end of the movie, built by "Movie" Mike. 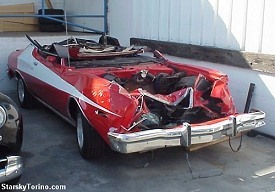 The roof was cut off after filming to remove cameras and such from the car. The 1973 Torino body on the right is the shell that sat on the Mic Rig, an Econoline Van with an extended frame. The shell sat on frame behind the cab of the van, and a camera and lights was mounted in between pointed at the front of the "Torino." 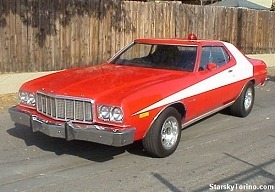 For certain scenes, a stunt driver drove the van, the camera shot through the front windshield of the car, and the audience thought they were seeing Starsky driving the Torino, but he was just pretending. We saw the complete Mic Rig on the movie set when we visited.